The ethics commission of track and field&apos;s governing body, the International Association of Athletics Federations, has issued a five-year ban on the former head of its anti-doping unit – and lifetime bans on the former president of Russia&apos;s athletic federation and two others. The case centers on doping violations by Russian long-distance runner Lilya Shobukhova "and the exaction of monies from her as the price to pay for enabling her" to compete in the London 2012 Olympics and other events, the IAAF commission says. "The life bans announced today could not send a stronger message that those who attempt to corrupt or subvert the sport of athletics will be brought to justice," IAAF President Sebastian Coe says. He added that the body is cooperating with investigations by the French authorities and the World Anti-Doping Agency. 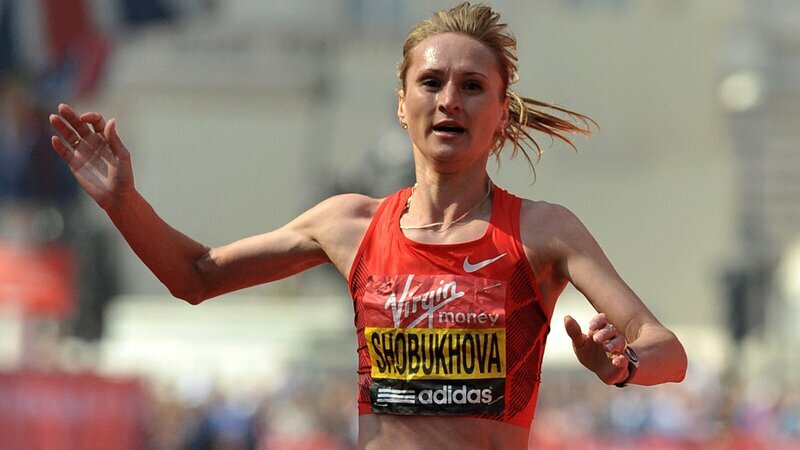 Shobukhova won marathons in London and Chicago in the span from 2009 to 2011 — a period in which the IAAF report says she earned well over $1 million. One month after an anti-doping panel informed her of abnormal blood test results in late 2011, large cash withdrawals began to be made from her bank account. Banned for life are Valentin Balakhnichev, the former president of the All-Russia Athletic Federation who was also the IAAF&apos;s honorary treasurer; Alexei Melnikov, a former ARAF coach; and Papa Massata Diack a former marketing consultant to the IAAF who is also the son of the IAAF&apos;s former president, Lamine Diack. "All three compounded the vice of what they did by conspiring to extort what were in substance bribes from LS by acts of blackmail. They acted dishonestly and corruptly and did unprecedented damage to the sport of track and field which, by their actions, they have brought into serious disrepute." The IAAF Ethics Commission issued its findings Thursday, along with Shobukhova&apos;s allegation that she paid 450,000 euros – $488,000, at today&apos;s exchange rate – to suppress abnormal blood test results. She also says more than $300,000 of that sum was repaid in 2014, after sanctions were taken against her. In 2014, Shobukhova was suspended for more than three years — a punishment that was partially retroactive. Her ban was ended seven months early last year, after she helped investigators. The case involved transactions in several countries. For instance, the money that Shobukhova, 38, says was repaid to her was routed through Black Tidings, a now-defunct company in Singapore, according to the commission&apos;s report. But one of the most straightforward elements in the evidence cited by the commission is an email chain forwarded from one now-disgraced official to another, and finally to Shobukhova, confirming the transmission of 300,000 euros. Gabriel Dollé, the former director of the IAAF&apos;s Anti-Doping Department, was given a five-year ban, the ethics panel says, because "his sins were those of omission, not commission." The report says he showed "an inexcusable lack of due care and diligence rather than of corruption." The ethics panel&apos;s report numbers nearly 120 pages; the word "corrupt" appears nearly 30 times, in different configurations.